Chef Woo Can's Background - If Chef Woo Can, You Can Too! I Love eating Asian food and a passion for cooking! I lived in suburbia in Massapequa Park, Long Island and I was considered a latch key kid. Both of my parents were working. My dad worked for a defense contractor and mom operated a Carvel ice cream store. I have 1 younger sister and 2 younger brothers . ​Being responsible, I helped out in the kitchen by making really simple dishes for the family. Dad and mom would come home and my siblings were out playing and I knew mom didn't want to cook a meal since everyone was tired. ​When we would visit our grandmother every Sunday in Chinatown, I always took an interest in what she was preparing for dinner, because all the relatives would converge that evening for a huge feast. ​Somethings, she prepared were, let's say different, but I got the basis of basic meals from her. ​Watching her prepare her special meals was interesting. Every dish she made always came with rice. Rice always went hand in hand with any Asian dish. Although rice had its unique mundane flavor, when it was eaten with a flavorful dish, it somehow made it taste even better! ​So, I took some of what I saw with my grandma and started to cook at home. Little did I realize that my family wanted more. ​My mom noticed that my cooking was pretty good and suggested I consider working in my uncle's restaurant in Chinatown. Being a teenager, sounded like a good idea spending my Summer in Chinatown. Now keep in mind I was All American and just looked Asian. ​First thing was first, wash the dishes manually. I said where's the dishwasher? My uncle gave me this look. I said where's the a/c in the kitchen? got another stare. I was sent to another station to prepare all ingredients, cut vegetables, peel shrimp, debone chicken (what happen to chicken cutlets), prepped everything. Then prepared individual orders for the chef. I needed to read Chinese, so I learned the hard way, trial and error. Make wonton for soup and fried wonton. Made the spareribs, everything. Snow peapod, the tough strands bordering the pod had to be removed. My whole time was prepping, prepping and more prepping. ​So, one day I asked my uncle when do I do the cooking? He says right now. He introduced the commercial wok. It was huge, turned on the gas and it was flaming under the wok, a little intimidating, showed me the basics of sauce mixtures, the art of stir frying and the order of ingredients to be cooked and finally taste. I learned all the dishes and attacked wok cooking with a vengeance. After awhile, things got to be routine. But that experience every Summer solidified my talents with Chinese cooking and other Asian fare. ​Many years later, I shared my skills at adult education schools in New Jersey and Maryland. What I came of these sessions were that my students thought it was a secret Chinese method of cooking. They believed that the food at their local take out or restaurant was authentic Chinese food. I corrected them and said what they were eating was American influenced Chinese food. To say the least they were dumbfounded. ​So the idea of introducing Asian cooking was something I loved to do and had the pleasure of watching my students enjoy eating these new dishes. A sign that they love eating my dishes was reflected in pure silence while eating. So, I decided to have a website to include cooking classes, a blog, foodie critic, recipes and catering. ​Deciding the name of my website was pretty interesting. It had to be something that people will remember me by. 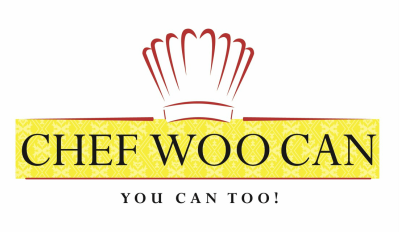 So, If "Chef Woo Can, You Can Too." By this title should take the nervousness off by saying, if I can do it you can too!